Automatically turns the eggs completely every 4 hours to eliminate manual handling and improve hatch rate. 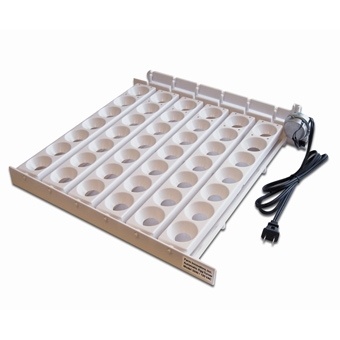 Simple to use - place in bottom of incubator and plug in. No assembly required. Dishwasher safe - egg rails snap out for easy cleaning. Comes with 41 large egg cups. Option small quail egg trays available. For use with Incubator Models 2100 and 2200 - included with Model 4200. Additional thermometer included.